If you are looking for an epic kitesurfing trip with guaranteed wind, Penghu is your perfect destination. Located in the middle of Taiwan Straight, the high pressure wind is squeezed and accelerated between the high mountains, up to 3000 meters, on both sides of the straits. The result is prevailing wind from 20 to 40 knot on a daily basis. It is probably the windiest place in Asia, if not in the world. Being far away form Mainland China and Taiwan, Penghu is blessed with clean air and pristine water plus sandy beaches. You can choose wave or flat water spots depending on your skill levels or personal preferences. Hit any buttons below to find out the wind forecast of Penghu. We own Sunrise BnB to provide you clean and comfortable accommodation at affordable prices. We also provide you scooters and trailer for you to go to and come back from the beaches safely with minimum cost. Need someone to pick you up from the airport? No problem, we got you covered as well. Just give us a call on your arrival, our van will arrive within 10 minutes of your call. You will be kitesurfing in no time. For any update of Jan or Karen, simply click "f" or "G+" to follow their social media sites. Karen is an enthusiastic kitesurfer. She either kitesurfs or thinks about kitesurfing during the whole windy season. As the highest WOO female jumper in the world, she always pushes herself to the limit, such as rigging 6.4 sqm kite when other bigger male kiters rigging 4.5 sqm kite under 40 knot wind. When wind is lighter, she practices hydrofoil and hope to compete in the international arena. Jan is Father of Karen. He moved to Penghu in 2003 after finishing his career in the high tech world. He has a life-long passion for windsurfing and kitesurfing. Winning many windsurfing competition tiles in Taiwan, he started kitesurfing in 2009. He enjoys wave riding and hydrofoiling right now. When he is not on the water, he teaches at the only university on the island, the National Penghu University. After recovering from her knee injury happened in Feb. of 2017, Karen worked hard to return to kitesurfing scene. CORE kite launched a XR5 Challenge campaign to invite the highest booting kitesurfers around the world to Capetown SA to kite along with Joshua Emanuel. Karen made best use of every windy day in Penghu and jumped 19.2 meter in Dec. and won the female group. She flew to SA on Jan. 5th 2018 and started her adventure in SA. When wind blows, Karen boosts. She hit her personal best, 20.5 M and broke her own record old record of 19.2M. After each session, all riders check their jump height recorded by woo device. Karen checking her best height with Willow-River shakes Tokin and Joshua Emanuel. Dine and wine with CORE team. Despite Penghu is a windy island, wind sometimes can be less than 20 knot. It becomes a little boring for hard-core kitesurfers because the jump is not as high as you hope for and the wave is small and far in between. What do you do in this light wind situation? Don't worry! As kitesurfers we know what is in your mind. We provide hydrofoil lesson on those unexpected light wind days. You get 20% off on our hydofoil lesson. The regular price is 6000 NT /2 hour. There are many kitesurfing spots you can choose depending your skill levels and preferences. Longmen Beach is only 1 minute ride from Sunrise BnB. Wave is excellent when wind is over 30 knot. Best timing for the wave is one hour after high tide. When wind is light or tide is low, this spot becomes less wavy and more friendly to the new comers. Chinglo is a flat water spot in a small cove, it is about 10 minutes ride from Sunrise BnB. The beach is in a small cove and water level is affected by the tides. This spot is at its best when at high tide. The launch spot has some sharp coral and kiters must be careful during their launches. Linto Beach is on the south side of the island and wind is off-shore in the winter. The wind direction shifts to the south in the summer and is on-shore or side-on-shore. It becomes a perfect spot for hydrofoiling. This beach is about 5 minutes drive from Sunrise BnB. Coming to Penghu is easy once you have arrived in Taiwan. The fastest way is coming over by planes. Simply choose one of three domestic airlines, Uni-Air, Mandarin, and Far East Air Transport (links of UniAir and Mandarin Airline provided below) and fly from one of the three domestic airports (Songsan in Taipei, Taichung and Kaohsiung) , you will reach Penghu in less than an hour. Once you arrive Penghu, call us (0956-065-509) and we will pick you up from the airport immediately. Manu Maier and his lovely wife, Pai Di quit their jobs in Germany and travelled to seek their dream kitesurfing vacation around the world in 2013 . 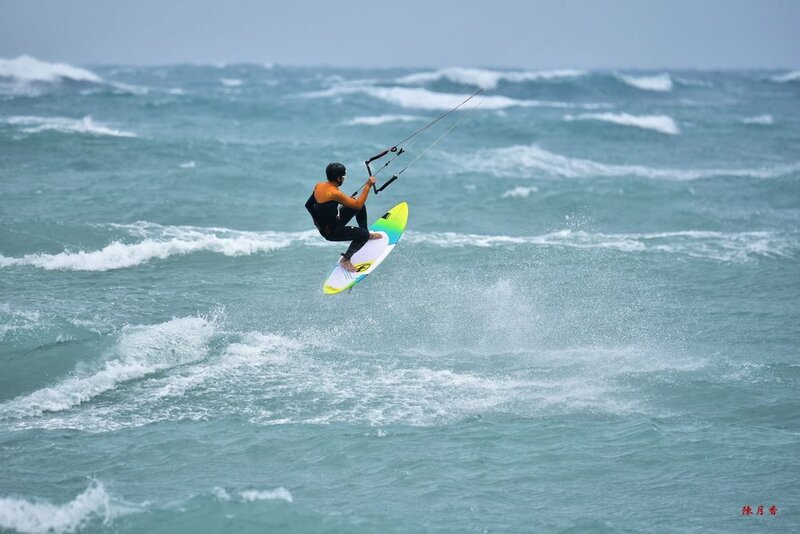 Their first stop was Taiwan...and they found their kitesurfing paradise in Penghu.